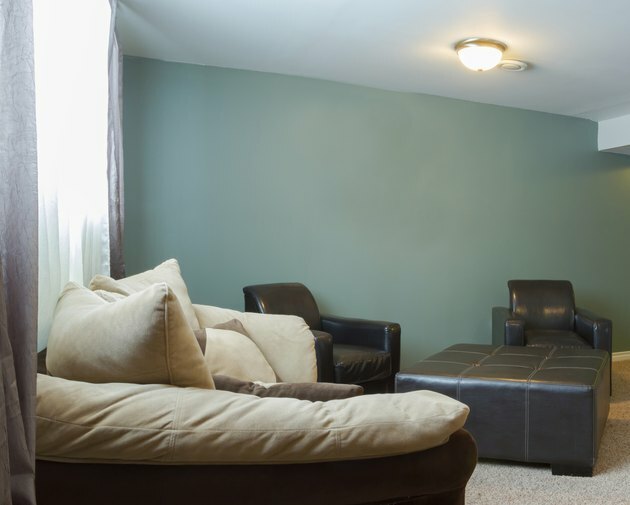 Don't let an unfinished basement deter you from creating a comfortable, extra living space. Vast improvements in affordable, do-it-yourself decorating materials make self-renovations well worth the effort. Concrete floors can be stained or painted to produce various decorative effects. Water-based stains come in a large selection of colors, leaving a film or coating on the concrete that may be translucent or opaque. Acid-based stains penetrate the porous surface and react chemically with the lime and minerals in the concrete. Although colors are limited to earth tones or a vivid blue, the result is a deep, rich, translucent marbling effect. Before painting a concrete floor, it should be properly cleaned with trisodium phosphate, sealed with a masonry sealer to prevent moisture from forming mildew, and primed with concrete primer to fill in the pores and even out the surface. Use stencils with stain or paint to create designs on concrete floors. Vinyl tiles or planks mimic the look of stone or hardwood flooring; however, vinyl flooring is softer and much less expensive. Click-lock planks or tiles create a floated floor that is not glued or nailed to the subfloor, but the concrete must be clean and level for a proper fit. Carpet tiles are another simple, do-it-yourself flooring cover option and can easily be customized with different colors and patterns based on how you choose to arrange them. Interlocking foam or rubber mats provide a soft surface for exercising or for a kids' playroom. Soften the look of unsightly concrete basement walls by hanging floor-to-ceiling curtains around the perimeter of the room or the area you are decorating. An easier alternative to installing curtain rods on concrete is to hang the curtains on picture wire attached to the wooden ceiling joists with eye hooks. Use a turnbuckle and an S hook on one end of the wire so that you can tighten it as necessary. If you decide to use curtains only on the windows, a ceiling-mount curtain rod might do the trick. Use long, floor-to-ceiling panels, but open them during the day for extra light. Painting cinderblock or concrete walls in hues of white, light gray, light blue or pale green brightens the basement and makes the room feel more expansive. Prepare the walls first with masonry sealer and primer. Disguise pipes and ductwork by painting the ceiling a uniform dark color. Painting the ceiling, pipes and ductwork all white will do the same trick. Give cinderblock the look of natural stone by sponging on various earthy colors in shades of brown and gray. 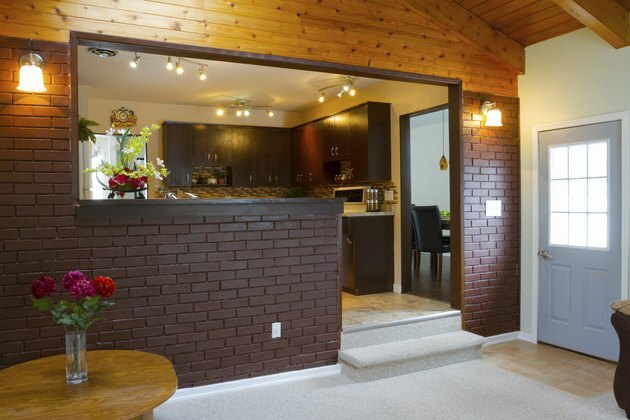 Use a random pattern, painting each brick separately and layering two colors on each brick for a natural look. Because of the extra work and colors needed, limit this technique to an accent wall. For a warmer, rustic accent wall, add wood planks to the wall. Seal the concrete or cinderblocks first to prevent moisture from rotting the wood. Attach the planks using construction adhesive in a caulking gun. 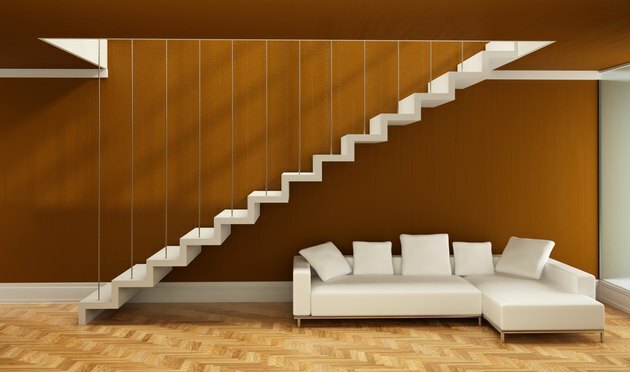 Vinyl wall decals are an affordable way to add personality and character to basement walls and adhere to concrete surfaces better after they're painted. Adhesive picture hanging hooks also stick to concrete with a smooth, painted surface. Otherwise, you'll need a masonry bit to drill holes for plastic or metal anchors to hold the screws for hard wall picture hooks. Hang paintings or photos of landscapes to compensate for the lack of outdoor views from windows. Boost the natural light coming in through small basement windows by installing mirror tiles on the side walls of the recessed opening. 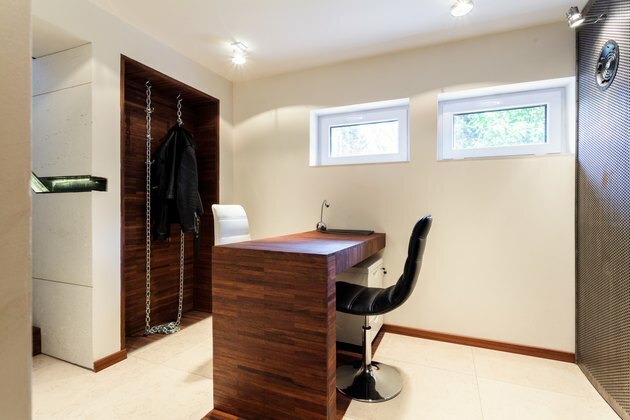 Combine with plenty of artificial lighting to brighten the room. Garden or patio lights strung across the ceiling create an instant festive atmosphere. 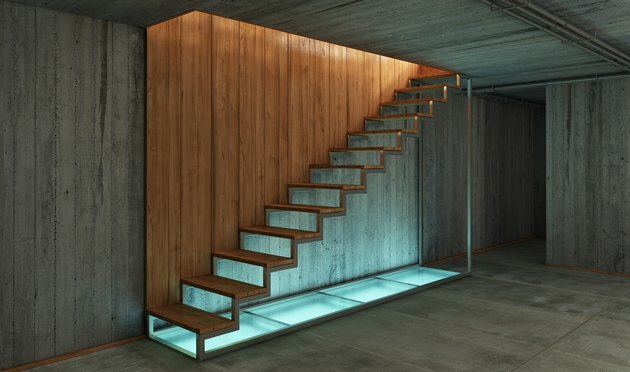 Layer lighting throughout the basement using floor lamps and table lamps. For mood-enhancing accent lighting, consider battery-powered LED candles or candle lanterns, which come in handy in the event of a power outage. 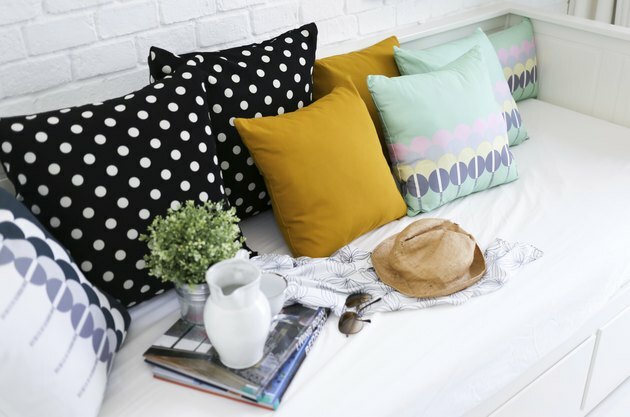 If you've moved older furniture from the upper levels down to the basement or found some thrift store bargains, make seating pieces look fresh again with new slipcovers. Include accent pillows and throws to impart a cozy, welcoming feel. Repair loose or wobbly legs on occasional tables and refinish the surface if needed. Wicker or sea-grass baskets placed underneath make attractive storage for frequently used items. Do-it-yourself storage cabinets help keep clutter at bay, and the tops provide a surface for table runners, vases, sculptures and framed pictures.